It is 1917 and Rachel and Isaac have been married for fourteen years. They left Chicago to settle in the South Dakota Badlands to farm a large quantity of land bought together. Rachel and Isaac’s love and family grow through harsh winters, excessive droughts, and back-breaking chores while trying to raise children and make a living from the land. This was not a typical lifestyle for African-Americans at that time. Isaac is a strong terribly ambitious ex-buffalo soldier with an extreme hatred for the Native American Indian. Rachel is a naive, worn down woman who is seeking love, family, and her own home. They enter into their marriage as a contract both hoping to get what they desire, where the harsh South Dakota Badlands puts them both to the test. The setting of The Personal History of Rachel Dupree is stark and lonely. This black family is not only isolated by their location but by their race as well. They are the only blacks farming in this area and their nearest neighbours are white and at least five miles away. Loneliness and isolation are omnipresent. Weisgarber got the idea for this novel after seeing a picture of a black woman in front of a sod dugout during one of her trips through the Badlands. 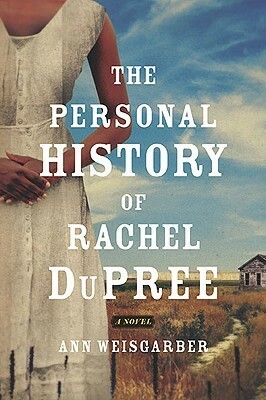 She felt that it was disappointing that this bit of African-American history had been ignored and began writing The Personal History of Rachel DuPree. This book has a myriad of themes running through it such as racism, feminism, farming life, family, marriage, and the list goes on. It would make an excellent book club choice. There is a lot to discuss. The Personal History of Rachel DuPree was shortlisted for the Orange Award for New Writers and longlisted for the Orange Prize in 2009. The Winner was An Equal Stillness by Francesca Kay. The is was an excellent start for Ann Weisgarber as a first novel. The topic was unusual and attempted in an interesting manner. In spite of that, I felt that it was strange how I didn’t really feel much for Rachel or any other character in the novel. I must admit I started to fill better about her by the end of the story. The best described character in the novel was Mrs. DuPree, Isaac’s mother. She was a stern, ambitious, mean-spirited, nasty piece of work. She brought some life to the book though. You could almost imagine what she looked like. I enjoyed the chapter on Ida B. Wells-Barnett (the first African-American journalist writing articles defending blacks and women), which was an excellent way of Weisgarber setting Rachel’s standards and expectations of life. It helped me understand more about why she made the quick decision in the first place to marry Isaac DuPree. In the end, I was glad to have read it, but I felt as if this book was missing something that I couldn’t seem to put my finger on. Ann Weisgarber was born and raised in Ohio. She has a Bachelor of Arts and Masters in Social Work and Sociology. She lives in Texas. She and her husband love the outdoors and visiting national parks. Her second novel The Promise was just released in March 2013. It is another compelling story with intriguing characters, love, and hidden secrets set in the midst of a natural disaster.